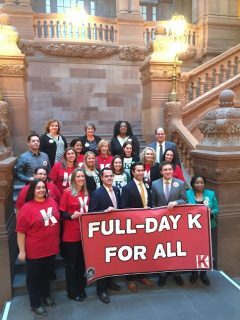 North Rockland’s Full Day Kindergarten advocates spent Monday in Albany advocating for bringing full day kindergarten classes to the district. What began as a local movement has joined with other forces around the state to ask for every district in New York to receive funding for the full day of school for the youngest of students. Right now, only a handful of districts in the state lack full day programs, including two in Rockland County: North Rockland and East Ramapo. The advocates handed out information to 100 senators and assemblymembers. They are photographed here with Assemblymen James Skoufis and Ken Zebrowski and Senator David Carlucci.